Let me tell you the story of our days. Traveling is a wonderful adventure peppered with tiny unimportant inconveniences. Each journey I have been on in my life has always included someone for me to look after. Now I am by myself—on my own. My dog Minna not excluded but how much trouble can she be? Yet each day rushes by—then meanders—then rushes again. The freedom is spellbinding but it is very hard to let go of the old ways. From first light my eyes open and I am warm and comfortable in my cozy bed. Minna beside me moans and stretches then lapses into second unconsciousness. My own eyes droop, I catnap, dream about the all the lovely people I have and will meet. I met some really wonderful people from Pennsylvania, yesterday at the street market in Charleston. They took my picture and wished me well on my Journey. Then I awake and start our day with the chores that simply cannot be avoided: straighten the bed, make some tea, some oatmeal with raisins, pick up any dishes remaining from the previous night’s repast. The day begins. It seems the chores take all of my time and before I know it is 11:00 a.m. and I have not done one EXCITING journey-like thing. As a photographer, I know that the early morning light is the best light. The evening light is second best but damn good anyway. So I promise myself before noon that today’s evening light will be mine to capture. Then I walk Minna on the beach. She loves it. I love it. 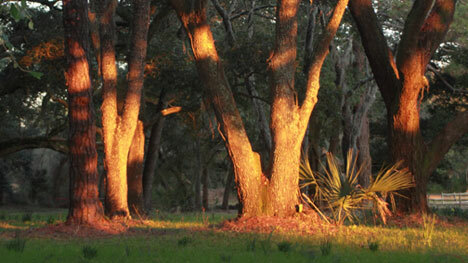 We are camped on Edisto Island in South Carolina. We have taken a camp space for thirty days. It is a special offered by the state to seniors. Oh yes, I qualify. Edisto Beach is famous for the great variety of sea shells to be found upon the beach. We poke around in the wave drifted piles that form at night and choose a few to decorate our campsite. When arriving at the point on the beach where pets no longer must be restrained (off the “park” beachfront), I release Miss Minna and she has the time of her life running, running, chasing, running. She charges me then dodges away at the last moment. She throws herself down in the wet sand and rolls, then runs some more. I stand by laughing. Encouraging her crazy antics by falling down in the sand and feigning sleep. She jumps up on my back. She nuzzles my ears. She is joyous for 30 minutes of just play. Just she and I and the surf. I don’t need to be anywhere. I don’t have anyone awaiting my call. Or expecting my presence. I may choose to play all day or maybe not. I return to the trailer and pack a lunch: a sandwich and an apple and a dog cookie or two. If it showers I do one thing. If it suns another. This morning it rained very hard. Tonight while I write the wind is kicking up and my sidekick tent is blowing about. So now at midnight I go out with a flashlight and tend to the tie downs. Tie a couple extra to the car bumper and to the trailer frame. I come back and Minna opens her eyes on the bed but complains not. The wind continues far into the night. I have great fear that my side tent will be gone in the morning. It is too dark, cold and windy to break it down now. Will the 35 mph winds tear down our side tent? Cross your fingers! 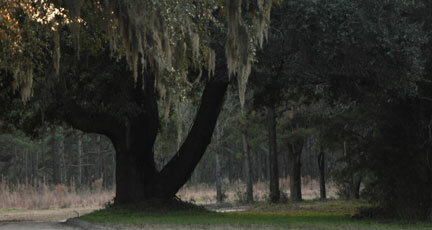 Earlier, at evening light, we wander down to Botany Bay, an old plantation now a state conservation area. We walk and see. See and walk. The light gets lower, the long cast shadows are intriguing. It happens just before “quiet light” that point in time when the sun turns everything gold and orange. Then the images begin to gel. The sun pierces the evening hush, like arrows of light. The sun burns it way down to the horizon. 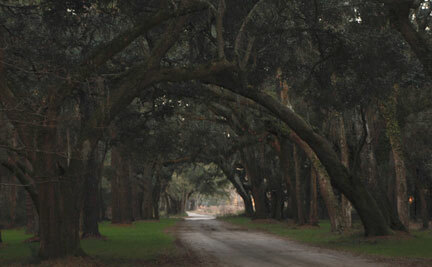 The trees arch over a meandering drive at Botany Bay. The quiet light is sensually soft on the landscape. This light is quite extraordinary. I take my time. There is no rush. A young couple happens along we chat about the snow storms up north and our 48 degrees, the light, my journey. They become fans. Promise to seek my blog. 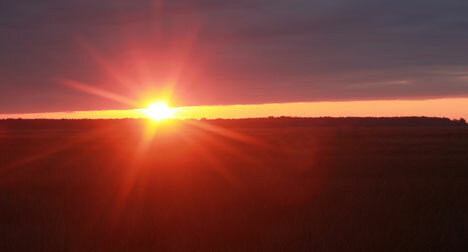 Minna and I walk on gradually, the quiet light overcomes the searing sunset light and the sun sinks below the horizon. This is the time for long exposures and tripods, Botany Bay is closing at sunset. We return to the car and wander toward home. Stopping here and there to explore. Swamp rainbows decorate the water surface. It is after dark when we arrive at our little camp trailer. We do the chores. Cook some shrimp in butter and garlic make some toast and a little rice. Eat and then go for a walk before bed time. Return and process today’s images, write for the blog. The day is done. Cozy bed. Body aching for sleep. Beautiful photography! I wish I was out traveling on a great adventure. Hey, have you ever heard of geocaching?